320 pages | 30 B/W Illus. This book provides a detailed understanding of how different types of engagements impact upon the reform and EU integration of the Western Balkan region. It examines the influence of Russia, China, Turkey and the UAE in the region and analyses the range of existing links. Contributors offer an academic and multifaceted perspective of the role of external and non-Western actors in the region that goes beyond, one the one hand, the tendency of some Western decision-makers to perceive all engagement by third powers as a sinister threat and, on the other, the view of regional governments of all external involvement as a boon coming at a times of Western neglect and reduced foreign investments. By looking at the importance of Russia, Turkey, China and the UAE in the Western Balkans, the book sheds light on one key arena of global competition, offers new insights on the strengths and weaknesses of Euroatlantic integration and advances our knowledge of foreign policy and its economic, social and security dimensions for small and medium sized countries. It will be of interest to academics, postgraduate and research students, and think-tankers with research interest in IR and Southeast European Studies. European decision-makers will also gain an insight into the extent of non-Western influence in the region. 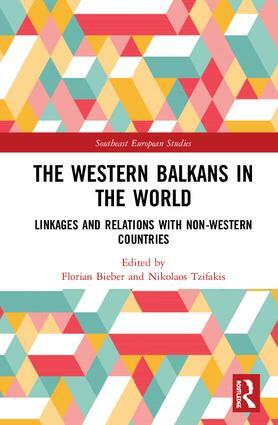 "The Western Balkans in the World" is a deeply thought-out, well researched and comprehensive exploration of the place of the region within the broader context of international relations. Instead of looking at each state in isolation, this volume analyzes the Western Balkans through a network of linkages, shared interests and soft power that are much broader than the region itself. The book is an extremely timely contribution to the scholarship on Western Balkans and foreign policy." - Jelena Subotic, Georgia State University, USA. Chapter 1 Security co-operation in the Western Balkans: Cracks and erosion of Euro-Atlantic integration? Chapter 3 Serbia: Looking East, going West? Chapter 4 Bosnia and Herzegovina: Abandoned by the West, embraced by the East? Chapter 11 Turkey: Forced marriage or marriage of convenience with the Western Balkans? Florian Bieber is Professor for Southeast European History and Politics at the University of Graz and director of the Centre for Southeast European Studies. He is the coordinator of the Balkans in Europe Policy Advisory Group (BiEPAG) and author of The Rise of Authoritarianism in the Western Balkans. Nikolaos Tzifakis is Associate Professor of International Relations at the Department of Political Science and International Relations of the University of the Peloponnese. His publications include articles in journals such as Cambridge Review of International Affairs, Conflict Security & Development, Ethnopolitics, European Foreign Affairs Review, Global Society, Problems of Post-Communism, and Voluntas. In 2008, he was awarded the Marcel Cadieux Distinguished Writing Award for his co-authored article with Asteris Huliaras, published in International Journal. The Balkans are a region of Europe widely associated over the past decades with violence and war. Beyond this violence, the region has experienced rapid change in recent times though, including democratization, economic and social transformation. New scholarship is emerging which seeks to move away from the focus on violence alone to an understanding of the region in a broader context drawing on new empirical research. The Southeast European Studies Series seeks to provide a forum for this new scholarship. Publishing cutting-edge, original research and contributing to a more profound understanding of Southeastern Europe while focusing on contemporary perspectives the series aims to explain the past and seeks to examine how it shapes the present. Focusing on original empirical research and innovative theoretical perspectives on the region the series includes original monographs and edited collections. It is interdisciplinary in scope, publishing high-level research in political science, history, anthropology, sociology, law and economics and accessible to readers interested in Southeast Europe and beyond.